Blackhawk Titan Hydration Pack FREE SHIPPING! The Blackhawk Titan Hydration Pack is a heavy duty rucksack that includes a built-in 100 ounce reservoir with a convenient drinking tube. Its Bite Me bite valve makes it easy to rehydrate on the go, while its Microban anti-microbial treatment keeps your drinking water clean and fresh. The pack itself is made from reinforced 1000 denier nylon, and features a lightweight structural frame built into its comfortable mesh back panel for increased stability. The internal space contains multiple pockets and tie-downs to organize your equipment, and the waist belt and exterior feature S.T.R.I.K.E. webbing for attaching accessories. 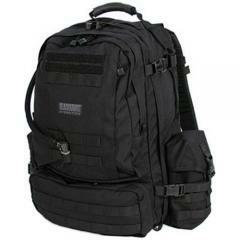 ©2002-2019 CopsPlus.com: Blackhawk Titan Hydration Pack FREE SHIPPING!